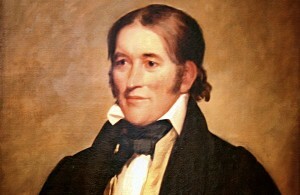 With a sparse education that amounted to no more than three months’ tutoring from a backwoods neighbor, Tennessean Crockett fought in the Creek War during 1813–1815, earning a reputation as a fearless Indian fighter, which helped to propel him in 1821 to the Tennessee legislature. There he fashioned his popular political persona and, in fact, showed great flair for spinning out amusing tales and homely metaphors, which found their way into a highly profitable series of almanacs and an 1834 Autobiography. Crockett served three terms in the U.S. House of Representatives, but after his defeat in 1835 he bade farewell to Washington —“You can all go to hell. I’m going to Texas”— and was among the Alamo defenders slain by Santa Anna on March 6, 1836.